Kendra Scott celebrates their Sweet 16 in Tampa! 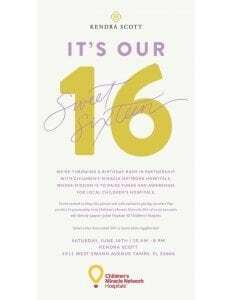 Visit the Kendra Scott store located at 1511 West Swann Ave., Tampa, FL to celebrate their Sweet 16 while also support sick kids. You’re invited to shop this private sale on June 16 with exclusive pricing on select fine jewelry, 20% of the events proceeds will directly support Johns Hopkins All Children’s Hospital. Previous post: Roaring good times with the Dairy Queen team!